Celebrity Edge changes everything. The way you experience the world; the way you connect with the ocean; the way you play, dine and unwind at sea. Revolutionary on every level, she’s the ship that’s setting a new standard of luxury and innovation at sea. 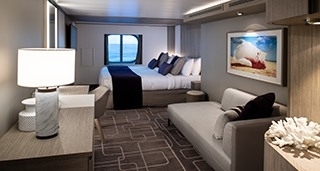 The way you cruise will never be the same again.Through teaming up with some of the world’s best designers, Celebrity created accommodation that has never before been experienced at sea. 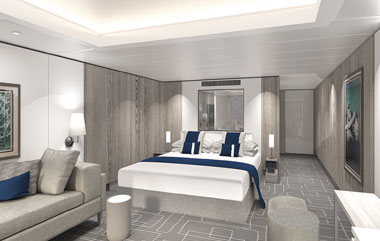 There new Edge Staterooms feature an Infinite Balcony – touch a button and your entire living space becomes the balcony, letting you walk right out to the water’s edge. Celebrity have created two exciting new suite categories too, and more than doubled the number of suites available. The new Iconic Suites are now the most luxurious and spacious in there fleet; while our six 2-storey Edge Villas boast 950 square feet of splitlevel, indoor-outdoor splendour. Luminae-private restaurant. Michael's Club-exclusive lounge. Personal butler service. Priority check-in & debarkation. Luxury Bulgari bath amenities & plush robes. Priority Tender Service. In-suite breakfast, lunch & dinner. Reserved theatre seating on Evening Chic nights. Fresh Flowers. Twice daily service (makeup and turndown). Celebrity eXhale™ bedding. Private safe. 24-hour room service. Private mini-bar. Complimentary tote bag. Custom blended bath products. Interactive Samsung flat-screen television. Personal veranda. New Cashmere Collection luxury king-sized mattress (except our 16 new Edge Single Staterooms with Infinite Veranda – they feature queen-sized beds) Two lower double beds convertible to King (except as noted). Some staterooms may have a trundle bed. Dual voltage 110/220 AC. Plentiful storage space in your bathroom and wardrobe. Smart TV. Individual safe. Mini-fridge. Stateroom 662 sq ft. veranda 93 sq ft. Personal butler service. Luminae-private restaurant. Michael's Club-exclusive lounge. Spacious veranda. Priority check-in & debarkation. In-suite breakfast, lunch & dinner service. Complimentary daily in-suite espresso and cappuccino. Luxury Bulgari bath amenities & plush robes. Reserved theatre seating on select nights. King-sized cashmere Collection bed. Veranda with lounge seating. Mini-fridge. Stateroom: 313 sq ft. veranda: 163 sq ft. Personal butler service. Luminae-private restaurant. Michael's Club-exclusive lounge. Spacious veranda. Priority check-in & debarkation. In-suite breakfast, lunch & dinner service. Complimentary daily in-suite espresso and cappuccino. Luxury Bulgari bath amenities & plush robes. Reserved theatre seating on select nights. King-sized cashmere Collection bed. Veranda with lounge seating. Mini-fridge. 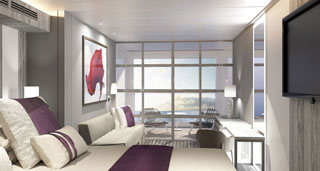 Stateroom: 313 sq ft. veranda 163 sq ft.
Luminae-private restaurant. Michael's Club-exclusive lounge. Personal butler service. Priority check-in & debarkation. Luxury Bulgari bath amenities & plush robes. Priority Tender Service. In-suite breakfast, lunch & dinner. Reserved theatre seating on Evening Chic nights. Fresh Flowers. Twice daily service (makeup and turndown). Celebrity eXhale™ bedding. Private safe. 24-hour room service. Private mini-bar. Complimentary tote bag. Custom blended bath products. Interactive Samsung flat-screen television. Personal veranda. 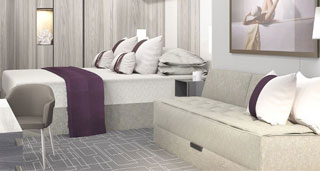 New Cashmere Collection luxury king-sized mattress (except our 16 new Edge Single Staterooms with Infinite Veranda – they feature queen-sized beds) Two lower double beds convertible to King (except as noted). Some staterooms may have a trundle bed. Dual voltage 110/220 AC. Plentiful storage space in your bathroom and wardrobe. Smart TV. Individual safe. Mini-fridge. Stateroom: 541 sq ft. veranda 242 sq ft. Premium ship location close to the Spa. Infinite Veranda with lounge seating. Celebrity's eXhaleTM bedding featuring the Cashmere Matress. Grohe®. Two lower double beds convertible to King (except as noted). Some staterooms may have a trundle bed. Shower panel and aromatherapy diffuser. Interactive Television system. Individual safe, dual voltage 110/220 AC, mini-fridge* and hair dryer. 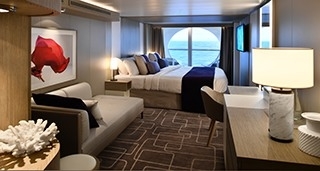 Stateroom 202 sq ft. veranda 42 sq ft.
New Cashmere CollectionSM luxury king-sized mattress (except our 16 new Edge Single Staterooms with Infinite Veranda—they feature queen-sized beds). Two lower double beds convertible to King (except as noted). Some staterooms may have a trundle bed. Dual voltage 110/220 AC. Plentiful storage space in your bathroom and wardrobe. Smart TV, individual safe and mini-fridge*. Stateroom: 200 sq. ft.
Celebrity’s eXhale™ bedding featuring the Cashmere Mattress. Two lower double beds convertible to King (except as noted). Some staterooms may have a trundle bed. Dual voltage 110/220 AC. Plentiful storage space in your bathroom and wardrobe. Smart TV, individual safe and mini-fridge*. Stateroom: 181 sq ft.